Pushcart-nominee Bruce McRae is a Canadian musician with over 800 publications, including Poetry.com and The North American Review. His first book, The So-Called Sonnets is available from the Silenced Press website or via Amazon books. To hear his music and view more poems visit his website: www.bpmcrae.com, or ‘TheBruceMcRaeChannel‘ on YouTube. As consumers we know we’re being sold an “illusion of happiness” along with our paper tissues and radial tires, but we know it through image and the quality of the voice “disclaiming… side effects.” The connection between our purchases and our self-image is unstated so it can remain unexamined. Bruce McRae will have none of that. 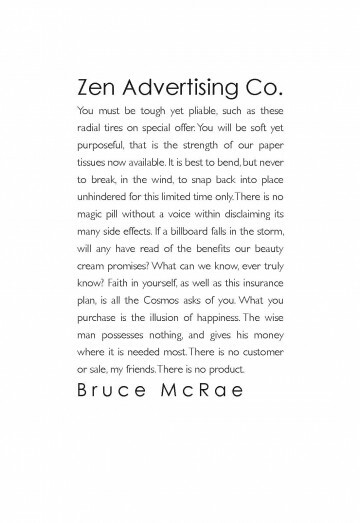 He loads his poem with Zen-like language to give the lie to the implicit claims of advertising in general and his own poem in particular. “There is no product” is a half-truth – the product is the customer, a Zen koan every advertiser has mastered. Zen practice works against self-focus, so the typefaces for this poem needed something neutral, something that almost disappears behind the text. Gill Sans has a thin stroke that leaves a very light mark on the page, forming the text and then receding, without judgment, into the surrounding white space. Century Gothic offers just enough additional weight to pin the poem down, suggest the column of other classified ads from which it’s been cut.